She gave me this delicious-looking butter pecan cheesecake recipe for reference and off to work I went, exploring ways to get to that same type of dessert, minus the dairy, sugar, gluten, and minus the baking, too (part of the request). Anyone else guilty of #procrastibaking? It’s my ultimate sidetracking skill it seems… Despite being snowed under with a bunch of work, of course I had time to experiment with multiple cake trials… :) The thing about procrastibaking is that somehow when I’m in that (not-at-all-avoiding-all-my-other-tasks) mode I often get my best baking done… and this time was no disappointment, as I ended up with this absolutely lovely autumn treat. While not an exact adaptation of the original, it was definitely inspired by all those delicious familiar flavors. The request was for this recipe to (ideally) be made raw too, and I gave that a good try. Out of all the experiments though, this near-raw recipe by far won my heart. For those curious about crust substitutions, I experimented with: Just nuts (cashews) — delicious, but coarser. 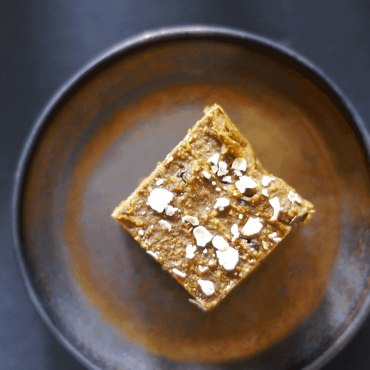 All oats — delicious, but a bit…. hmmm… dry? A mix of cashews and oats turned out to be best. But the crust is quite flexible — feel free to use all oats, all nuts, or a mix to your liking. I skipped the “butter” in the pecans part because… well, I’m just not into all that butter. Sorry! :P I know it’s delicious to some, and of course you can totally use that as a basis — frying pecans in some (non-dairy) butter and (coconut) sugar. On that note, I have to admit my “candying” technique here is quite lazy (toss in an oven bag with some maple and bake till candied). I do have a really awesome candied pecan recipe on the blog already, but I felt for this type of recipe a quick / easy hack was best, considering you’ve got a whole cake to make… Streamlining things means you can fast forward to all that deliciousness, asap. If you want the cake to be super light and fluffy, let it thaw out 10-15 mins first and you’ll get that soft and delicate consistency. And last but not least, this recipe would be most ideally made in a removable bottom tart pan. I’ve been moving and so didn’t have access to mine, and ended up going for my 6″ mini pie plate instead. Worked a treat, but the first piece was hard to get out gracefully, after which point though the rest glided out with ease. You can also use a 5″ springform pan instead if you prefer (though you’ll need to reduce the recipe by about a ⅓. Or simply use any dish of a similar size, but line it with parchment first so you can get the cake out easily. 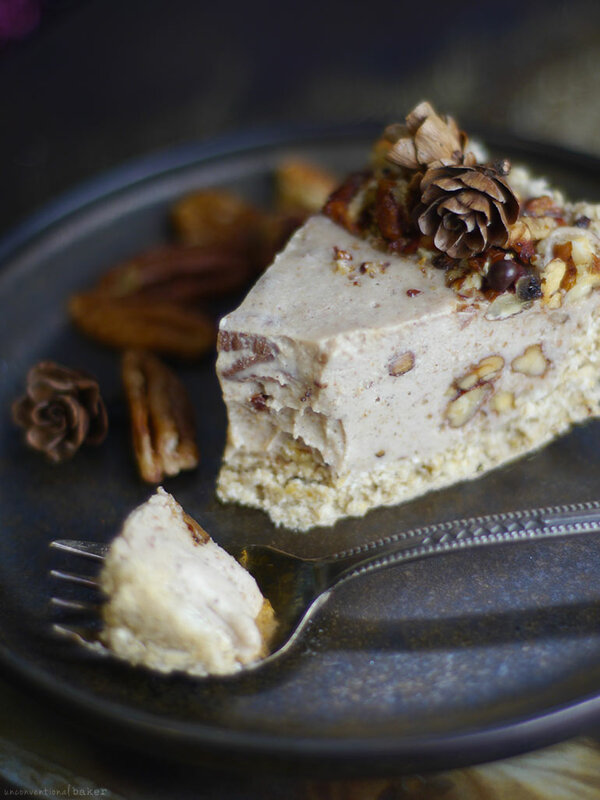 A delicious no-bake vegan cheesecake made with flavorful toasted, candied pecans (gluten-free). CANDIED PECANS: Pre-heat oven to 350F. Place pecans and maple syrup in a parchment baking bag, close tightly and shake vigorously to mix the pecans and maple. Bake for 10-20 mins until the maple caramelizes over the pecans (ready when the maple becomes crisped on the pecans; if it’s still wet, keep baking until ready. Just keep an eye out so they don’t burn — nuts can go from zero to burn quite easily sometimes…). Alternatively, toss pecans in maple in a bowl to coat lightly, lay out on a dehydrator sheet and dehydrate until crisp (6-8 hours). Cool the pecans off to room temp, then chop. CRUST: Process all crust ingredients in a food processor into a sticky fine crumble. Transfer the mixture into a 6″ pie plate (or a dish of a similar size) and press down into an even crust along the base and edges. Freeze while working on next step. FILLING: Blend all filling ingredients in a power blender into a smooth consistency. Fold in ⅔ of the chopped pecans (by hand), leaving the remaining third aside for decorating. Transfer the filling mixture into the prepared crust and level out the top. Sprinkle remaining chopped pecans around the edges. Freeze for 5-6 hours to set. Thaw out on the counter and enjoy! (Keep leftovers frozen). * To pre-soak nuts: place in a glass bowl, cover with water, and leave to soak for 4 hours (or overnight in the fridge). Then strain and discard the water. For a quick pre-soak, cover with boiled water and soak for 15 mins, then strain and discard water. (Note: this technique doesn’t preserve the nutrition of the recipe as well as the traditional soaking technique above). Additional Note: the purpose of soaking the nuts is to re-hydrate them and plump them up for blending into a smooth, cheesecake-like consistency. Proper soaking techniques also maximize nutrition and digestibility. If you’re interested in learning more about nut soaking and other dessert prep tips and tricks, I delve into these subjects in detail in my book Unconventional Treats. 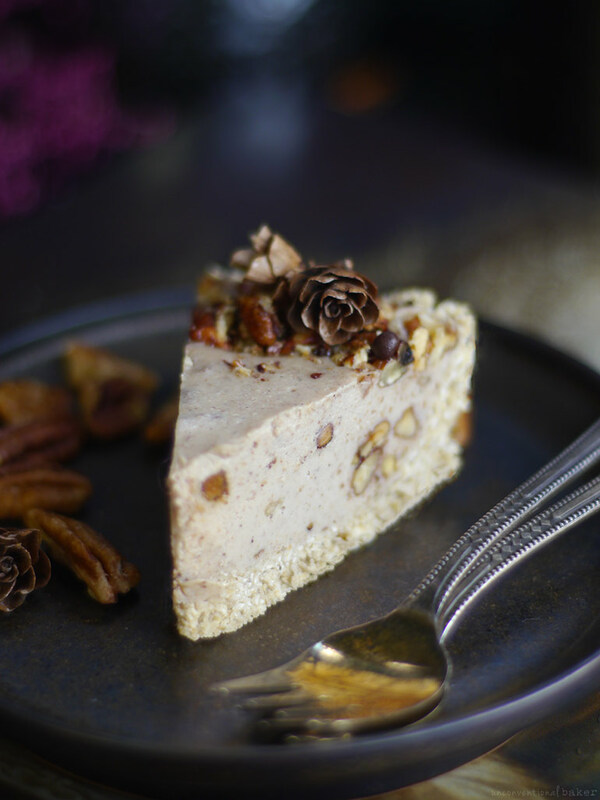 This pecan cheesecake is divine! In short, MAKE IT! You will not regret it. -I ran out of maple syrup and subbed Lakanto maple flavored syrup. -I burned the first batch of candied pecans so I settled for my second batch of lightly toasted non-candied pecans. -I used Forager unsweetened plain cashew yogurt in the filling. It’s very sour and lends itself perfectly to vegan cheesecakes by replicating the tangy characteristic of non-vegan cheesecakes. This is another great tip I learned from Audrey’s baked cheesecake recipe! -I ran out of coconut oil after making the crust so I used coconut butter in the filling. It turned out to be one of the most delicious cheesecakes I’ve ever had (and if you’re wondering, the other cheesecakes that top the list are also Audrey’s). The cheesecake is creamy, tangy, maple-y, not too sweet, rich, incredibly satisfying, and totally addictive. I served this to my in-laws who are skeptical of anything vegan. Well, they haven’t stopped raving about it! They could not believe it was vegan and gluten-free. I’m pretty sure they’ll ask me to make this for our next gathering. I also served this to my partner, brother, father, and two other friends. They all loved it. Audrey, I can’t thank you enough for your amazing recipes! Firstly, I’m so sorry for taking so long to reply. I’ve been traveling a lot this past month so some of the comments slipped right past me ?. Thank you so much for your kind words. Reading your experience was the best feedback ever. I love that your in-laws liked it so much :) And thanks for sharing the alterations — it’s great to hear what works. English is not my first langage and I dont know whats does it mean. Hi Jade. “gf” is a short form I use for “gluten-free”, and “c” is short form for “cup”. So that’s 1 cup of gluten-free quick oats. If you’re not gluten-free, then you can just use a cup of regular quick oats. I made this for my family this Christmas & it was HANDS DOWN THE BEST DESSERT I’VE EVER MADE, PERIOD. HOLY SMOKES. I tripled the recipe for a 9.5″ springform pan & it worked perfectly. None of us could handle how incredible it was. Straight from the freezer it tasted like a frozen yogurt cheesecake. Absolutely delightful work, Audrey. Thank you. Yay, Jocelyn :) So happy you all liked it so much! Thank you for the lovely feedback. “Raw pecans, presoaked and strained” – soaked for how long and what is it that actually needs straining? Do you mean just don’t include the liquid in which they’re soaked? Do I just soak them whole? Thank you!!! Hi Kao. You can do a quick soak by placing them whole (peeled) in a glass dish, covering with boiled water and letting them soak for like 15-20 mins. Or you can do a raw nut soaking technique by covering them in room temp water and letting them soak for 4 hours or even overnight. You strain the water they were soaking in and discard it. The idea is to soften and re-hydrate the nuts, so that they then plump up and blend into a smooth, velvety, cheesecake-like consistency and texture. Can I use coconut yogurt for this recipe? I have not seen sweetened coconut yogurt in the stores here – so should I slightly up the maple syrup/honey in the recipe? This looks so amazing! However, the filling recipe doesn’t seem like enough?? Is it missing the cream cheese? I’m new to this vegan style so I’m not sure if its just me lol. Thank you!! 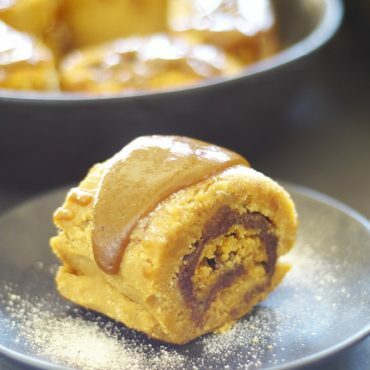 Looks so delicious, can’t wait to make!! Hi Heather. Just double checked the recipe — it’s all right :) The quantity in the recipe is correct — it’s a very small pie dish (only 6″ in diameter, so you can’t fit any more filling into it). If you’re using a bigger pie plate (like a traditional 9″), you’ll need to triple the recipe. 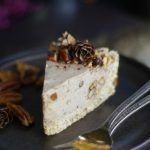 There is no cream cheese in the recipe, as it’s non-dairy and I’m not a big fan of using the commercial non-dairy cream cheeses because it’s hard to find ones with good ingredients (at least where I am), so instead I opt to create recipes that taste just like cheesecake minus the cheese (and dairy). And no worries at all about newbie questions — feel free to ask away as needed :) Though I suspect you’ll learn the ropes pretty quickly after trying out a few recipes. Happy baking! Beautiful! 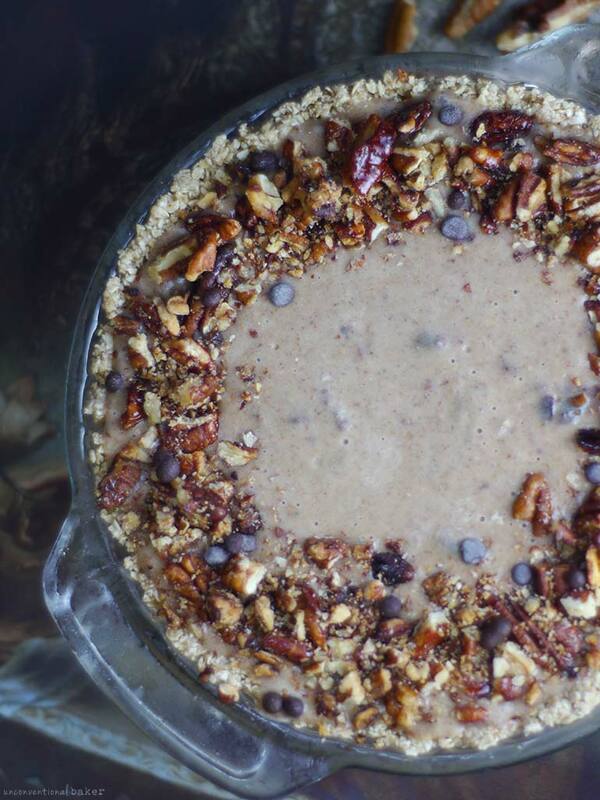 As soon as my no-bake vegan pumpkin cheesecake is gone, this cheesecake is happening! Cheesecake and pecan pie are two of my favorite desserts, and this is the perfect marriage between the two. Keep the raw cake recipes comin’ girl!